What you need: You need several tricycles or Big Wheels, blindfolds, and orange construction cones. How to play: Divide the kids into equally numbered teams. 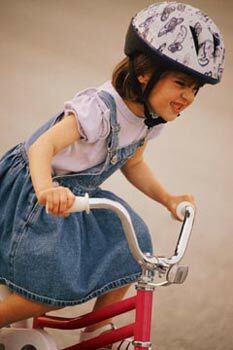 Each team will get a tricycle or Big Wheel and a blindfold. Set up a course for each team by putting out three to five construction cones, evenly spaced. The rules: The first player for each team will get on its tricycle and be blindfolded. The next player on each team will be the backseat driver and instruct the first player how to drive around the cones and back to the start. Once the first player returns, the backseat driver becomes the tricycle rider, and the first player goes to the back of the line to be the last backseat driver in the game. Play continues until all team members have gone. How to win: The first team to complete the race is the winning team. What else you need to know: If you don't have any construction cones, you can use milk jugs or buckets filled with sand or water. Last Night's Look: Hit or Miss? Xgauge code Ambient temp in Fahrenheit? Why not go red? All the celebs are doing it. Update on us. Flying home today. Get the Look of Kate's Chignon! Get candy-colored nails for spring!